Dr. Bhuvana Muthuswamy believes in providing excellent, personalized care to patients with a variety of medical conditions. Her areas of clinical expertise include prevention and wellness, health screenings and diagnosis and management of acute and chronic illnesses. She works to provide the best care she can through good communication and patient education. 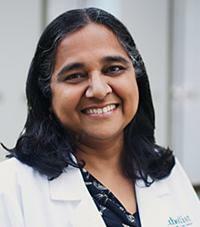 Dr. Muthuswamy is a board-certified internist by the American Board of Internal Medicine.